There have been some outstanding new developments in the world of music for iOS users this past few months! 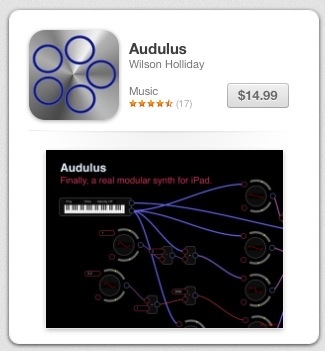 First has been the actual release of AudioBus for iOS. As they say on the iTunes Store… This is a revolutionary new inter-app audio routing system allowing you to connect your AudioBus compatible apps together with virtual cables. In other words…. I can be playing a synth on my iPad, like Magellan, and record it into my MultiTrack DAW on the same iPad! This opens up very different possibilities of being able to record from a long list of currently compatable apps into other apps on one iPad instead of having to have two devices or using audio copy/paste. Check out their website for currently compatible apps as the list is changing almost daily! In the late 80‘s I remember spending many hours programming keyboards for the ministry team at college that I was involved in. It was great fun to get inside of a synth patch and make all sorts of tweaks to it to come up with a new patch that was my own. Little did I imagine then, that I would be able to do this on an iPad with a color, touch screen! 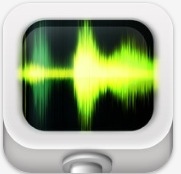 Check out the list of apps othe AudioBus page. I think there are some outstanding apps there that will make some outstanding music! Imagine if we could get these apps into the hands of our students in a non-traditional music class! The first person is Rheyne – Rheyne uses live looping with analog keyboards, USB controllers and iOS devices. The videos on his channel are all performed live! The integration he has between all the apps and devices is stunning! His music is digital and does not attempt to re-create an acoustic instrument performance! The second group is the DigiEnsemble Berlin – This is a group of professional musicians trying to turn mobile devices into instruments. This group has music of both the electronic nature as well as classical and everything in between. You can see them recreating a classical string ensmeble using iphones and ipads for instance or performing Starlight (from the alternative rock band Muse) and then performing a magical, musical interpretation of Silent Night. This sort of musical creativity needs to be taught in our schools alongside the traditional Band, Choir and General Music classes. Of course that means new classes need to be created and staffed! The biggest reason we need these sort of classes is that our students would be forced to become the innovators, the ones creating and designing the final product. There are not many programs like these in place yet so the development of this type of course is going to muddy water and the learning process will be messy. Let’s wade in and get dirty! So I am trying to get more organized with working the iPad into a good workflow with my lesson planning. I have been looking for a way to write up my lesson plans that I can sync between my MacBookPro, the Band Room iMac, my iPad and that will also allow me to display each classes lessons on the projector screen for each class. It just makes sense to me that we should not be having to re-type thing. I don’t want to type lesson plans into a plan book, then have to re-type for the principal and then re-type it again into a Keynote for the class to see what’s on the agenda for the day. Duplicate Work=Wasted Time! PlanBook Touch for iPad seems like it just might do the trick. The iPad app works with the Mac app and those both sync to DropBox. The app also lets me track standards that I am addressing. (more about this in a moment) The Mac app also allows for integration with iCal – I have not explored this so I’m not sure how it works and to what benefit it would be. The Standards portion of the app is interesting in the fact that I can have all the standards in one place, alongside my lesson plans and it will allow me to track which ones I’m over teaching or under teaching. The only thing is that unless someone has all the standards already in a CSV file, I’m going to have to go through and manually enter each one. 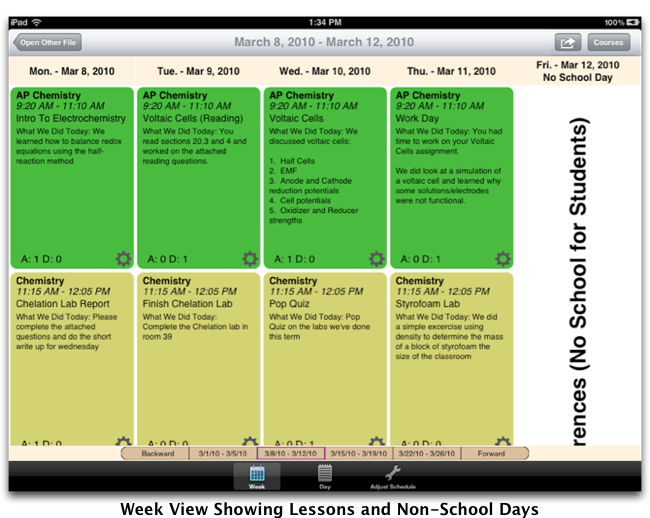 With this app it seems to be a pretty easy job to display the daily agenda onto the projector screen for the kids to see so they can be prepared for that days rehearsal. I’m wondering what other iPad toting teachers are doing right now as a solution to lesson planning and sharing lesson plans with the students/teachers. Does anyone have a good workflow that is working for them right now? What apps are you using?